Bowie State’s Rob Chesson had an incredible 97-yard run and a historic day on Saturday that you probably missed out on. 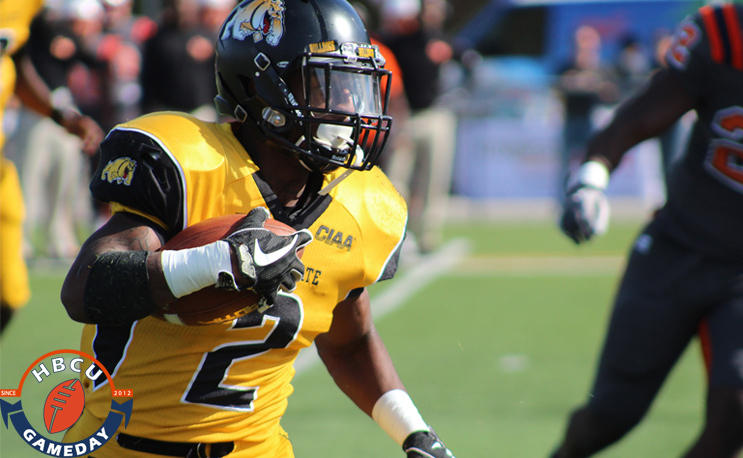 There was a lot going in college football on Saturday, especially in the CIAA. Virginia State and Fayetteville State punched their tickets to Salem, VA for the conference’s championship game in a pair of nailbiters in Petersburg and Winston-Salem, in two games that will be remembered for a long time. But almost lost in the midst of those instant classic games, Bowie State’s Robert Chesson put on a show that cannot be ignored. The crown jewel in his performance? A 97-yard touchdown run in which he zig-zagged a gassed Elizabeth City State defense all over the field in one of the best runs you’ll see all football season, and maybe longer. See for yourself. Here is a look at that same run from a different angle. Chesson zig zags from sideline to sideline and runs basically the length of the field all in 23 seconds flat. Far from a one-game wonder, his regular season totals are outstanding. Chesson has rushed for 1,332 yards and 20 touchdowns on 167 carries for an average of eight yards per carry. He also caught 23 passes and three touchdowns. In a year where the CIAA has been full of gaudy offensive playmakers, Chesson has often been overlooked despite All-American-type numbers. He’s stood in the shadow of running backs Trent Cannon of Virginia State and Stevie Green of Fayetteville State, as well as his all-everything teammate Amir Hall. But make no mistake about it Chesson is a force to be reckoned with and his running ability will be key to taking pressure off of Hall and the passing game when the playoffs start in two weeks.